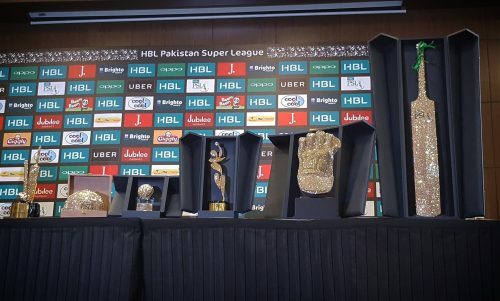 DUBAI (92 News) – The trophy for the third edition of Pakistan Super League (PSL) was unveiled in Dubai on Tuesday. Trophy was brought to the venue via helicopter, from where it was received by the captains of PSL teams. The ceremony had begun with a press conference which was addressed by Pakistan Cricket Board (PCB) Chairman Najam Sethi and some of the star players of the league namely, Shahid Afridi, Shoaib Malik, Darren Sammy, Brendon McCullum, Imad Wasim and Misbah-ul-Haq. During his speech, the PCB chairman recalled that Sarfraz Ahmed, skipper of Pakistan in One-Day International, Test and T-20 International formats, wrote history with bringing home Pakistan’s maiden Champions Trophy in 2017. He thanked owners of all the franchises for their support and cooperation in organizing the league. The event was attended by the managements and owners of the PSL franchises, along with top officials from the Pakistan Cricket Board. The opening ceremony for the tournament will be held on Thursday ahead of the first match between Peshawar Zalmi and Multan Sultans.